You know how there are those books that give you all the chills and make you really uneasy, where you don’t like a single thing that is happening with the plot and the characters bother you to bits, where the storyline is so disturbing that you almost pull out your hair, and yet it is nearly impossible to put the book down and you keep turning pages! 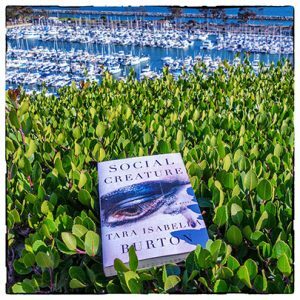 Social Creature by Tara Isabella Burton belongs in that category. Louise is an ordinary girl trying to make ends meet, struggling with multiple jobs when she meets rich and spoiled Lavinia. Soon they develop a deep bond and Louise is pulled into the dazzling glamorous lifestyle of parties, drinking and drugs. She is awestruck by it all and loves every moment of her new life. But nothing lasts forever, and when cracks start showing in their friendship, things turn ugly. This is a story about toxic friendships, unhealthy obsessions, morally questionable actions and detestable characters all based in the glitzy glamorous world of New York City. Beneath it all, Social Creature is also quietly clever. The characters are multidimensional and the manipulations subtle. Even though it gives away a lot towards the beginning, the build up is still sinister. There is no big twist and it is mostly about the hows rather than the whats, and yet, the transformations the characters go through is appalling and slightly scary. Burton has also made some excellent points on how much of our lives get portrayed on social media and how very misleading the screen life of check-ins and photos can be. Social Creature is a compulsively readable and bizarre story that is menacing and tragic at the same time. I liked it and yet didn’t like it, hence the three stars. Disclaimer: I won a free copy of this book in the Goodreads giveaway by Doubleday Books. All opinions are my own. I absolutely love the way you structure your reviews! This book sounds so interesting! I’m definitely going to have to check it out. Thank you so much Lexie 😀 This was a weirdly interesting story. Hope you enjoy!